Short here, just spent a night in Auckland trying to figure out what to do, stay here til my flight leaves, go over to the coromandel and see cathedral cove or push north, to the Bay of Island. The reason it is not crystal clear is because I've got a cold, which means blocked sinuses, which means no SCUBA. This is a bit of a problem since some of the worlds best diving is located just of the coast of the bay of islands, Poor Knights Island! I ended up with a gamble, continue north and hope my nose clears up. If nothing else, I can hopefully catch some waves at least, but I really wanna try diving on the Poor Knights. 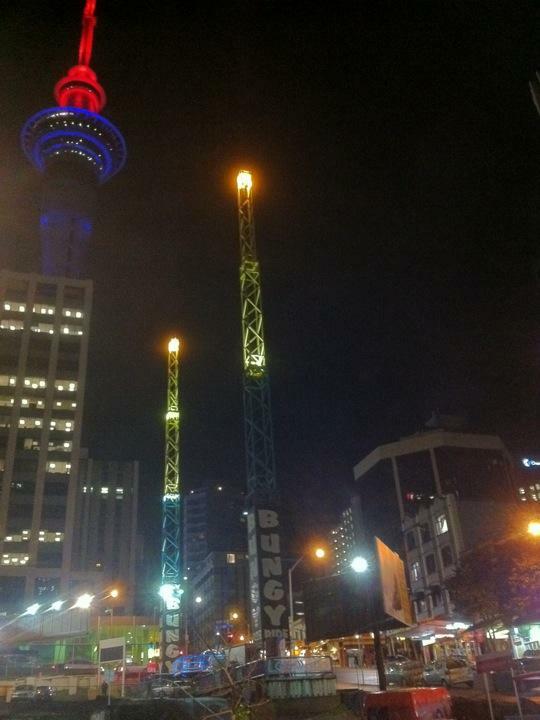 The picture is btw a contraption I saw last night, a reverse bungy. What they do is strap you to a "chair" for a lack of better word, strap the chair to the ground, tighten the bungy straps and then let go of the chair, sending you skyrocketing and then soaring down again, bouncing up and down for a while. Looked cool, but I didn't have the time right then.